Due to the Poodle’s famous coat and fanciful haircuts, the best brush for Poodles is a necessity. Having the best grooming utensils should come as no surprise. This breed requires more maintenance than other breeds. And it doesn’t matter if you have a show Poodle or a companion Poodle. Poodles are work. Intelligent, adorable and curly-haired, these dogs make fabulous pets. With a simple routine and the proper tools, you can keep your prized Poodle looking sharp. Poodles need brushing, and they need a lot of it. In fact, according to the American Kennel Club, most Poodle owners opt to brush their Poodles regularly, with some organizations insisting once a day is best to keep your Poodle’s coat at her healthiest. This is primarily due to the Poodle’s unique coat and curly hair. So, what kind of coat do Poodles have? Let’s find out. What Types of Fur Do Poodles Have? While it has long been known that Poodles are a great choice for dog lovers who suffer from allergies, the truth is that poodles are not technically hypoallergenic. There is actually no such thing as a dog who is 100 percent hypoallergenic. Despite a common misconception, the Poodle does shed, although he sheds minimally and actually sheds hair, not fur. Furthermore, the Poodle only has a single layer of hair, unlike many other dogs who shed heavily due to their double-layer coats. Best of all, Poodles do not produce as much allergy-inducing dander as many of their other canine counterparts. Unfortunately, the Poodle’s unique curly hair is a double-blade sword. So, while her hair does make life easier for allergy sufferers, it can take more time as far as maintenance. How Often Should You Brush a Poodles? Regardless of the haircut, most Poodles will need to be brushed regularly. For many Poodle owners, this means every day. This is because your Poodle can easily become matted. Her hair can become tangled if it is not properly kept up. This is particularly true if your Poodle is highly playful and active, as most Poodles are. Poodles are naturally athletic, curious dogs who love to play and enjoy the water. This means your Poodle could be prone to getting messy. And, you should note that if your Poodle has a puppy cut, which is one of the easiest Poodle hairdos to maintain, she will still need to be brushed daily. Luckily, brushing your Poodle every day does not have to take up much of your time. So long as you stay on top of her coat’s needs and make sure that her hair does not become tangled or matted, a daily brushing routine should only take a couple of minutes. The tools you may need to brush your Poodle could vary, depending on her hairdo. Each brush or comb above can serve a different purpose. The slicker brush, for example, works with small wires to detangle any mats or tangles. The pin brush works with the slicker brush, helping to get out more difficult tangles. These tangles may ave developed in your Poodle’s ears, tail, under her arms or anywhere her hair is longer. A rake brush does as you might expect based on its name. It rakes out any loose hairs, debris or dirt from your Poodle’s fur. The Rake brush is also the brush that is able to get nearest to the skin. Finally, a good metal dog comb helps to detangle knots, mats and other snags in your Poodle’s fur. This is an especially useful tool when you have a longer-haired Poodle. Now, let’s go over some of our favorite brushes for Poodles. The Furminator Rake Brush for Dogs is an excellent choice for Poodles because it has rounded pins, which rotate to reduce any pain during brushing. It also lowers the chance of tugging and pulling your Poodle’s fur when working on mats. Next, we recommend the Poodle Pet Self Cleaning Slicker Dog Brush. This slicker brush is fabulous for curly-haired dogs like the Poodle. It works to gently remove tangles while leaving a beautiful shine. Another slicker brush on our list of favorites is the Glendan Dog Slicker Brush. This brush promotes healthy skin and hair by removing dirt, dander and other impurities from your Poodle’s gorgeous coat. And if you are worried about mats in your Poodle’s luscious locks, check out the Safari Dog De-Matting Comb. The gripped handle makes it easy to use. The balled prongs mean your Poodle will never feel a poke while you are busy brushing him. And to round it out, we are crazy about the Andis Pet Steel Comb. This product is great for a number of breeds, but we love it for the Poodle because it is the perfect finishing tool for fluffing up your Poodle’s puff. It also removes tangles and mats, and helps to promote healthy skin and hair by stimulating the follicles. Most groomers agree that you should have a routine schedule for brushing your Poodle. Try and make it a positive experience. Grooming really is an excellent opportunity to bond with your dog. Offer her treats and lots of praise during the brushing process, especially if she is new to it. She can then associate her daily brushing as something good. Start at your Poodle’s head, and work your way down to the tail. Most groomers suggest beginning with a slicker brush to work through the smaller mats and tangles. Then go from there, depending on what tools you have at your disposal. We suggest working in sections, removing tangles and debris one patch at a time throughout your Poodle’s body. If possible, try and brush your Poodle the same way every time so that she knows what to expect during brushing sessions. This will make the routine easier and quicker for both of you. To watch a video on how to properly brush a Poodle, click here. Poodles are one of the most versatile dog breeds when it comes to hair styling options. But did you know that the original Poodle cut was more for working purposes and less for vanity? That’s right. The Poodle started out as a water dog, hunting ducks in cold, harsh conditions. Her elaborate pom-poms were actually utilized to protect her body from the severe conditions of the freezing waters she would hunt in. It wasn’t long before the Poodle’s haircut became somewhat of a fashion statement. Today, there are a number of fun haircuts you can offer your Poodle companion. For the Poodle who is more for companionship and less for show, the Puppy Trim is a wonderful, easy way to keep your pup looking pup-like for years to come. The hair is mainly long all over the body, but fluffed up or clipped shorter in certain places. For example, the hair around the head is longer than the ears, and fluffed upward into a half-disc shape. The hair along the ears hangs longer but out of the way of the top of her head. Easy to maintain and adorable to look at, we simply cannot get enough of the Puppy Trim. One of the most elaborate of the Poodle’s haircut options, this hairdo will have your Poodle resembling a lion. Shave her from the shoulders down, only leaving hair on her shoulders, the top of her head and the end of her tail. The Bikini Trim, sometimes referred to as the Miami Trim, has the Poodle’s paws, tail and muzzle clipped short. Pom-poms are left on her paws and tail. The Kennel Trim is perhaps the most famous of all the Poodle cuts and is the one you are most likely to see in show. It leaves a pom-pom on the head, the paws and the tail. Despite the idea that Poodles are considered hypoallergenic, they do shed and require a lot of upkeep when it comes to grooming and brushing. 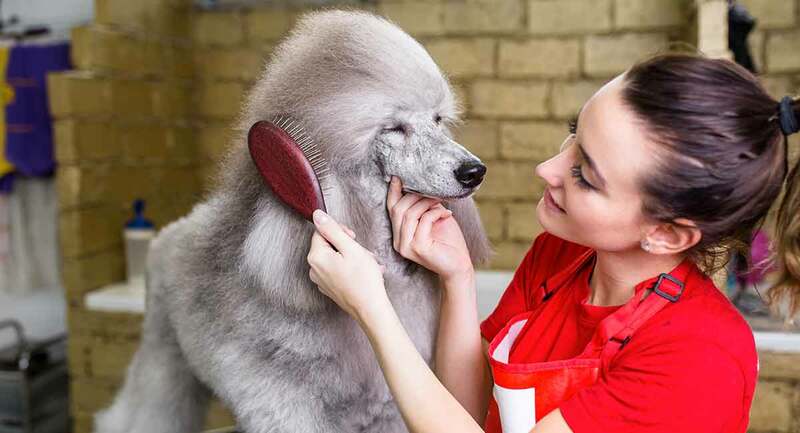 While you may continue to search pet stores and websites for your favorite brush or comb to keep your Poodle’s fur perfect, remember, quality counts. Look for brushes that promote healthy skin and hair. They should not damage your Poodle’s curly cues or harm her sensitive skin. Do you know of any wonderful dog brushes for Poodles we should know about? Comment below.